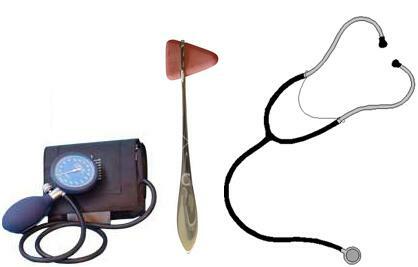 Diabetes Mellitus (DM) is a chronic disorder of glucose metabolism with hyperglycemia triggered by conditions associated with a relative or absolute insulin deficiency. Insulin is an anabolic hormone with profound effects on the metabolism of carbohydrate, fat and protein. Less severe hyperglycemia is called Impaired Glucose Tolerance (IGT) which is associated with an increased risk of developing diabetes in future. 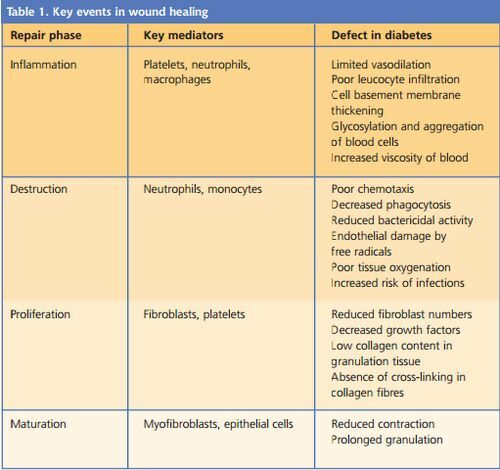 Here is a illustrative video to review your basics on process of wound healing. 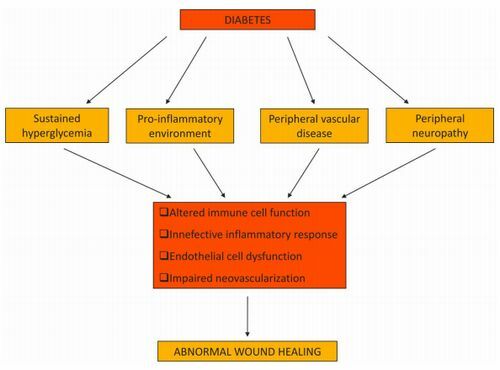 Atherosclerosis and other vascular changes in DM leads to impaired circulation leading to hypoxia and decreased nutrient supply at the wound site which in turn impairs wound healing. Hypoxia increases Reactive Oxygen Species (ROS) which mediates the activation of caspase-3 leading to dysregulation of apoptosis and delayed wound healing.